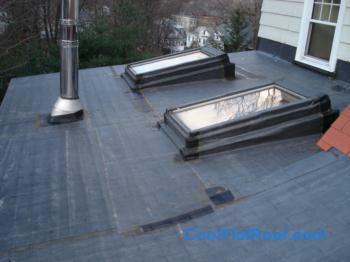 Below you will find before and after pictures, and short descriptions of some of the roof installations in Massachusetts, Connecticut and Rhode Island that we’ve recently done. 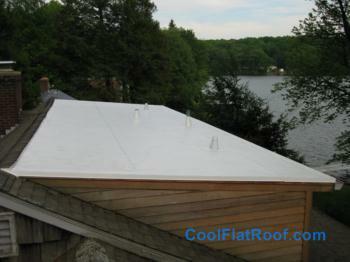 We will be updating the gallery, as we process the pictures that we have taken, and as we install more roofs. 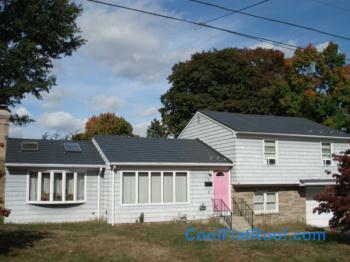 The pictures are categorized by state. 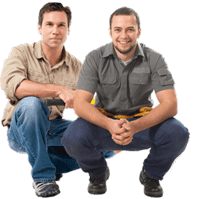 If we’ve already written a job review, we will provide a reference to job profiles after the pictures. 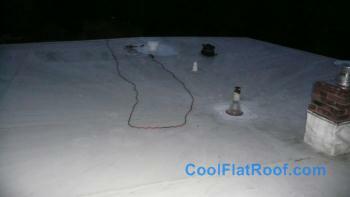 Flat Roofs: All flat roofs were IB PVC flat roofs, that replaced old rubber, tar & gravel or built-up roof systems. 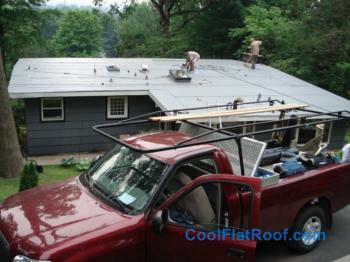 Metal Roofs: all metal roofs were either metal shingles or standing seam metal roofs in steel or aluminum, which replaced old asphalt shingles roofs. 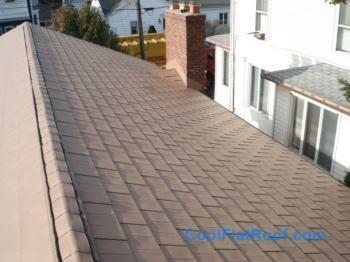 If you like the work we do for our customers, call us today – 617-444-9020 or fill out a quick roof estimate request form to get a free customized price quote to replace your roof. 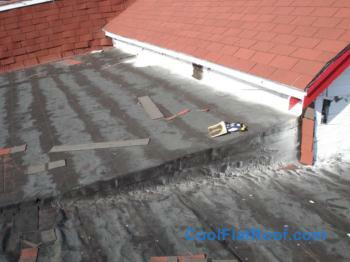 You can also see more of our roof installations – check our our roof video gallery. 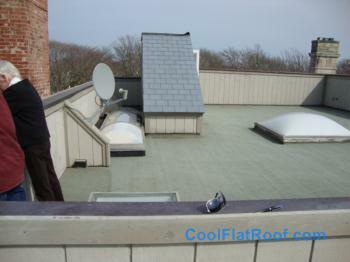 Two layers of leaking rubber membrane were removed and a new 50 mil white IB PVC roof was installed with 1/4″ per foot tapered insulation system, to eliminate ponding water leaks – read a complete review of this flat roof installation in Cambridge, MA. 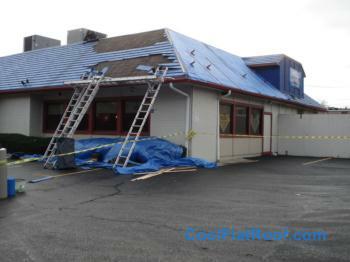 An improperly installed rubber roof was leaking inside the building. 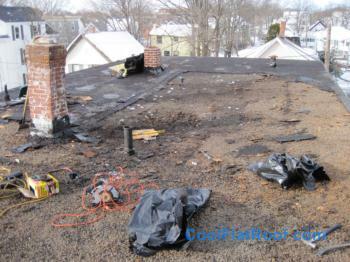 We removed the old rubber membrane, wet insulation and 2 layers of asphalt roofing. 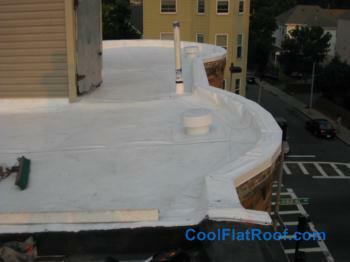 We also rebuilt a completely deteriorated brick parapet wall around the roof perimeter, and installed a new 80-mil IB Roof – check out the full job profile of this flat roof installation in Boston, MA. 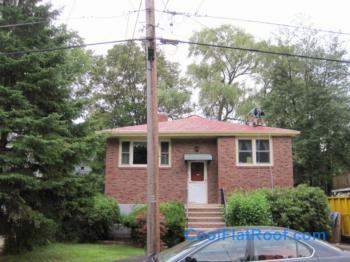 Two layers of old asphalt shingles were removed and new plywood installed along with GAF Deck Armor breathable synthetic underlayment and new Tamko Steel Shingles Metal Roof – Stone Crest Slate profile in burgundy red color. 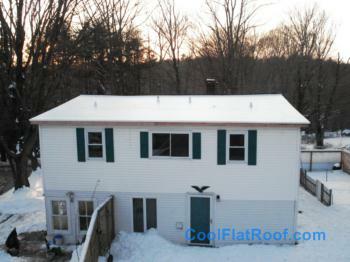 Read the full description of this metal roof installation in Attleboro, MA. 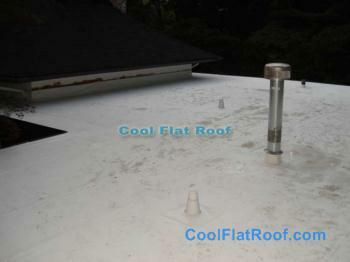 After a rubber roof repair in the fall of 2009, the leaks on one section of this roof stopped. 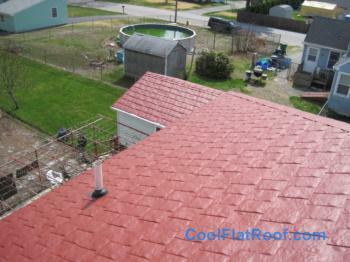 However, there were more leaks on other sections of the roof, which were too expensive to repair, and the homeowner chose to install an 80-mil Red IB roof (to match the color of roof shingles on the exposed part of the roof). 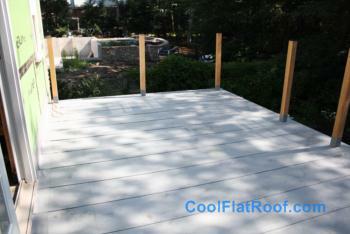 A new construction home in Wellesley, MA had a garage in the back with a walk-out roof deck / patio. 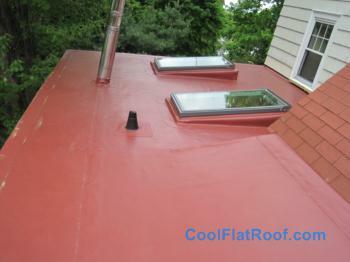 We installed an 80 mil IB roof with special slippers to separate the membrane from the floating deck on top – read the full project description of this flat roof deck in Wellesley, MA. 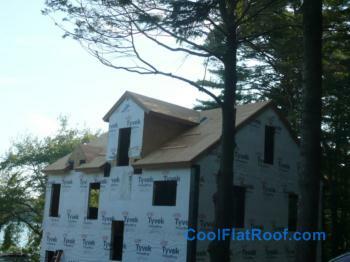 A flat roof with copper trim work installed on a new construction home near Newton Center. 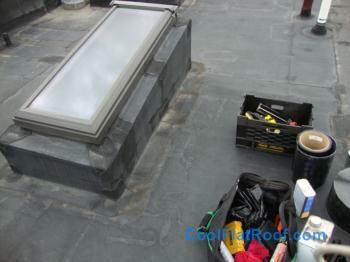 As part of the job, we also installed an IB roof on a 4×16 feet balcony. 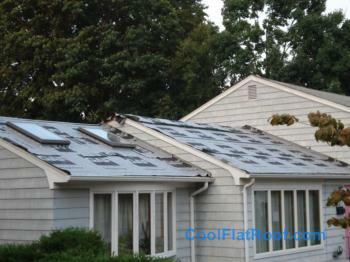 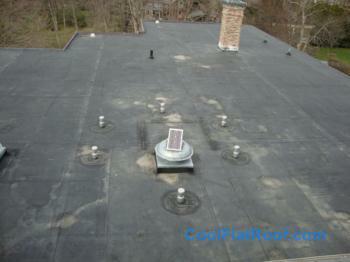 Read a full overview of this roof installation in Newton, MA. 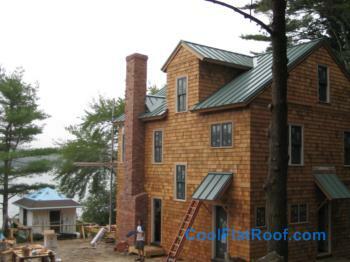 A new construction classic colonial house on a private lake-front home in Plymouth MA – homeowners chose to have a Patina Green aluminum standing seam metal roof installed. 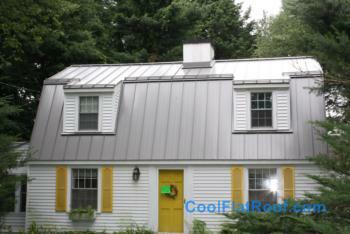 The color of this metal roof greatly compliments the natural cedar siding installed on this home (typical Cape Cod style siding). 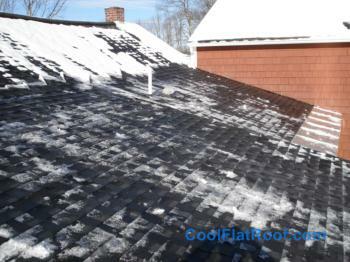 The homeowner of this gambrel style roof house in Wayland, MA was having Ice Dams related roof leaks issues for years, and even after installing flat aluminum sheets along the roof edge, the problems did not go away, only now the sliding snow was also damaging the gutters. 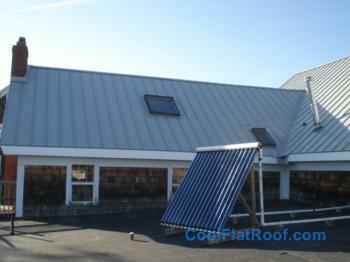 An aluminum standing seam roof was chosen for this relatively low slope roof, and a heavy duty snow retention rail system was installed to prevent the snow from sliding off, which posed danger for people living in the house and would continue to destroy the gutters below – read the full description of this standing seam metal roof installation in Wayland, MA. 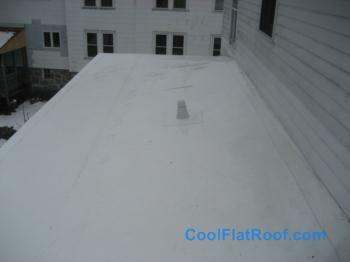 An old rubber roof was installed incorrectly, and a membrane contraction caused the drip edge to pull out on one roof section and also roof-to-wall flashing pulled out on another section of the roof. 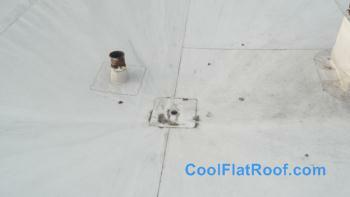 We replaced both sections, adding 4 inches of insulation to improve thermal properties and reduce heat loss. 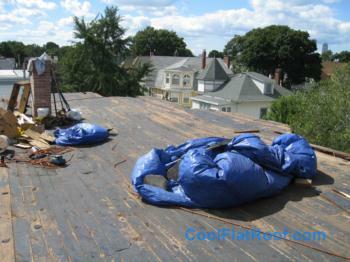 Read a complete overview of this project – Roofing Lowell, MA. 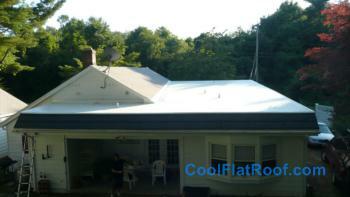 In the pictures above, the roof is a 4 year old IB PVC roof installed by another company. 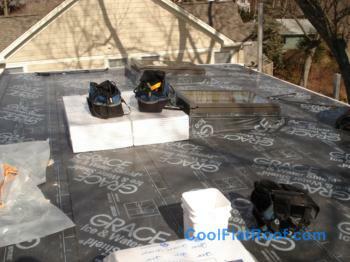 The homeowner did not feel comfortable working with them again and called us to install two 8″ IB attic vents and IB U-flow drain. 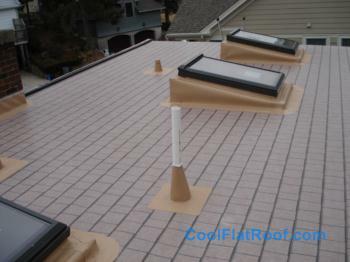 The original contractor did not install any roof ventilation and the drain was a simple membrane liner, which did not seal to the drain pipe and was leaking during heavy rains, due to water overflow. 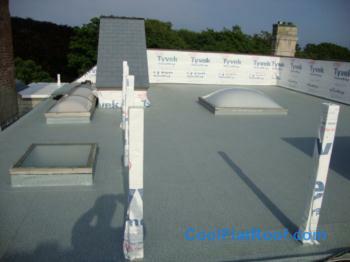 PVC roofing is the longest lasting type of single ply flat roofing materials. 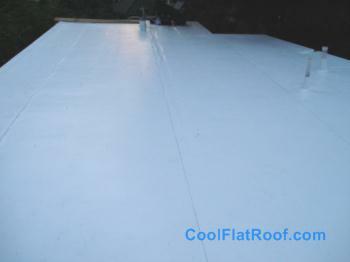 The hot air welded seams keep the roof watertight, membrane formulation prevents the material from curing, and maintains membrane welding qualities. 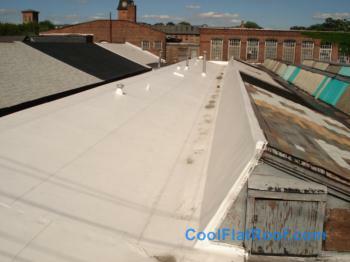 Still, sometimes even PVC flat roofs leak – check out this PVC roof repair article and two old PVC roofs that we’ve repaired in Massachusetts and Connecticut. 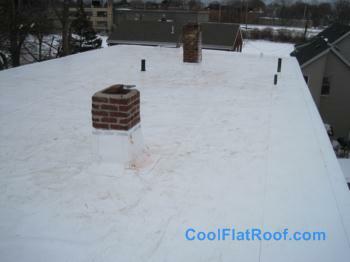 Low slope roofing in New England is especially problematic for homeowners due to Ice Dams and wind driven water, and inability to ventilate them, due to low roof pitch. 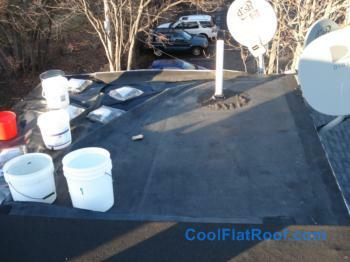 Even the Ice and Water shield usually does not help in preventing leaks. 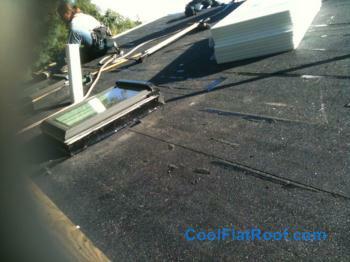 This is where the IB roofing membrane is perfect. 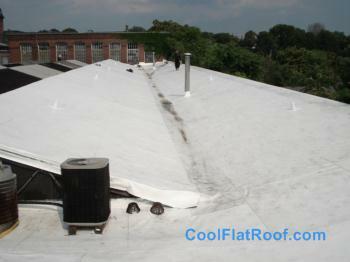 With hot air welded seams, your roof has one single piece of covering, which eliminates any potential leaks. 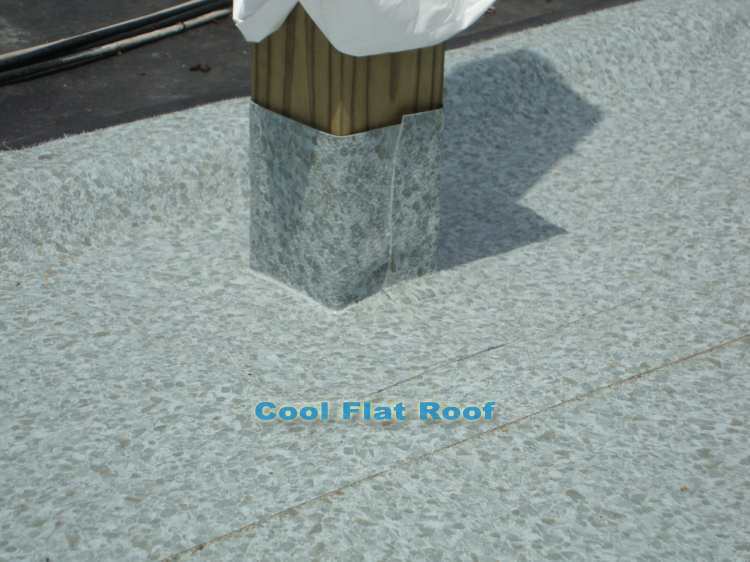 If your roof is visible off the ground, IB Roof Systems has developed a special product for residential low slope roofing – IB Traditions, which is essentially an IB roof with an aesthetically pleasing look of asphalt shingles. 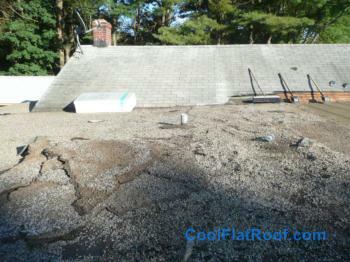 The low slope roof in Westminster, MA (above) and the three following roofs (Arlington, Hingham and Grafton MA, as well as two roofs in Andover, CT (below) all demonstrate how we solved the low slope roof leaks issues. 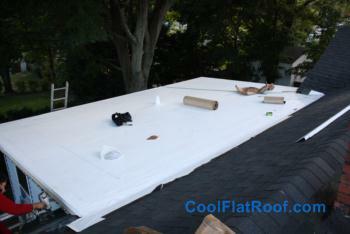 More roof installation pictures of this Residential flat roof installed in Arlington, MA. 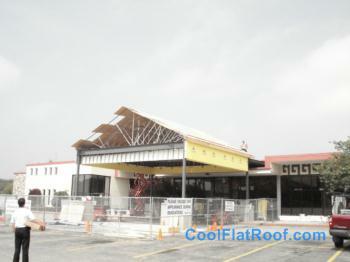 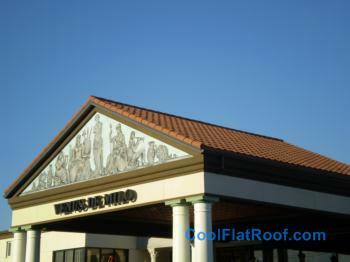 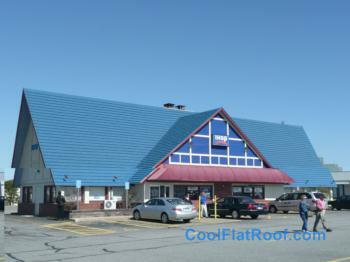 More pictures of this IHOP restaurant aluminum shingles metal roof in Hyannis, MA. 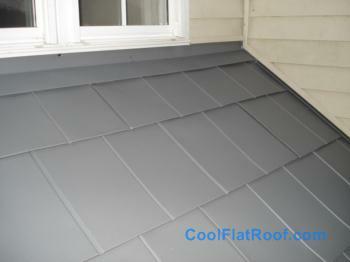 More pictures of Stone Coated Steel metal Roof in Swansea, MA. 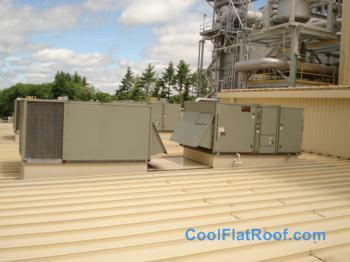 An industrial metal roof on the Bellingham electric power plant had leaks at the in-field seams between roof panels and around HVAC units and power air vents. 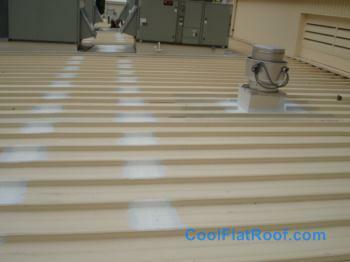 We used urethane flashing compound used in flat roof coating, and reinforcing mesh to flash all around the curb-mounted HVAC units and all seams. 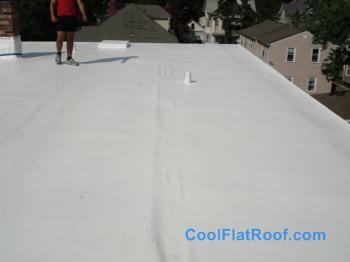 More pictures of industrial metal roof repair in Bellingham, MA. 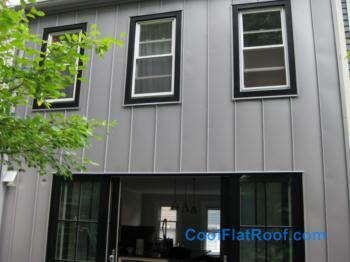 Contemporary design home in a classic neighborhood of old Charlestown – an aluminum standing seam metal roof was installed vertically, making metal wall panels siding in premium metallic color and black door / windows trim – here is a review of this installation in Charlestown, MA. 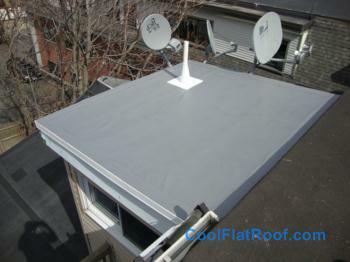 This roof was originally installed by Classic Metal Roofs of Stow, MA (the same company that we mention above, in the PVC roof repair in Bellingham, MA). 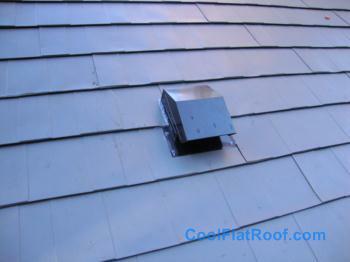 When the homeowner needed to add a range-hood roof vent, the original contractor was very reluctant to help out, saying they would need to send out a salesmen first to estimate the cost, and then a whole roofing crew to install the vent. 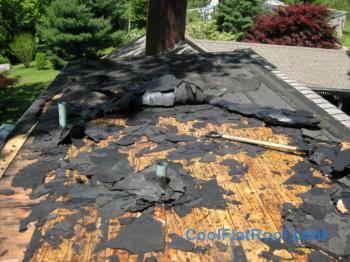 We came out (one roofer) and took care of this issue. 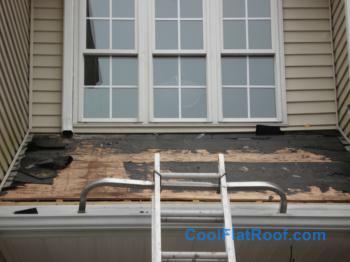 A small porch roof was constantly leaking due to a design flaw, where the entire development of the new home had the issue of all the water from the main roof above, draining onto this small porch roof. 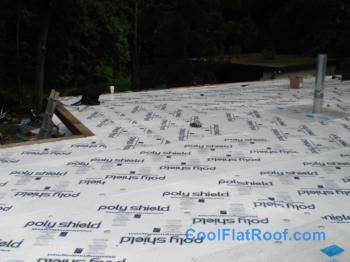 We removed the roof shingles and installed a GAF Deck Armor underlayment, in one piece, including roof to wall flashing, which created continuous flashing on all three sides of this roof, and stopped the leaks. 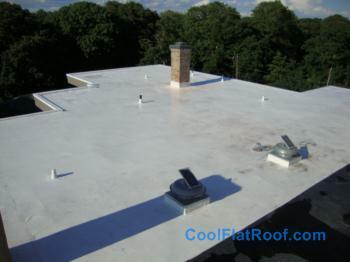 This 80-mil IB flat roof was installed in the summer of 2007, right before 4th of July. 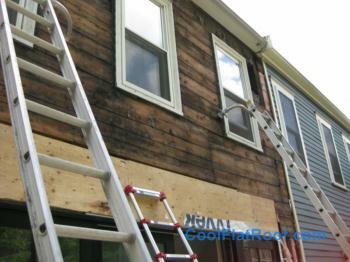 The homeowners had major leaks and were expecting friends and family over for the holiday, but did not want to have their stay spoiled by a leaking roof. 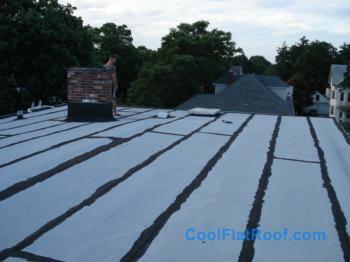 We had only a few days to get the main part of this project done. 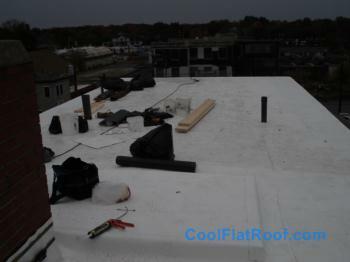 We had to tear off the old rolled asphalt roof, install new insulation, build a skylight curb, install the roof and flash 3 roof vents, a large masonry chimney, the skylight and all roof penetrations, as well as weld all seams. 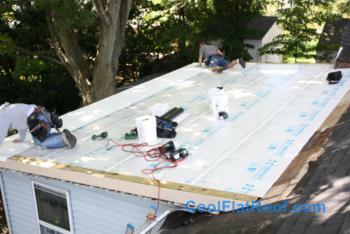 Everything was to be done in 3 days, as there was a major rainstorm coming on the fourth day and on the 4th of July right after. 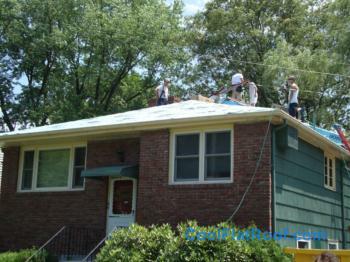 The homeowners also wanted the roof to be mostly done before the holiday – no construction site look on their roof, which was completely visible from the street. 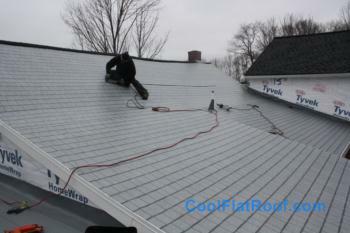 Here are some more pictures of this roofing job in Wallingford, CT. 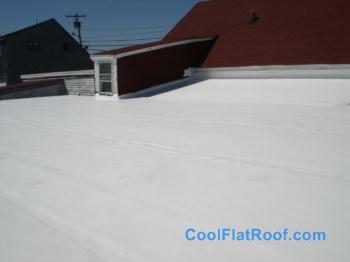 This 80-mil white roof was installed in place of a leaking tar and gravel roof. 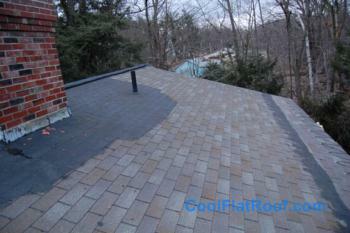 We removed old roofing, replaced approximately 150 sq. 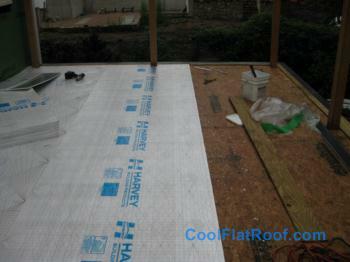 ft. of rotten wood and rebuilt the framing on the sloped mansard section, as well as replaced the asphalts shingles roof above the flat roof. 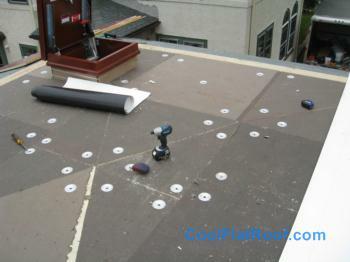 The mansard section recieved Steel Metal Shingles to improve the looks off the ground. 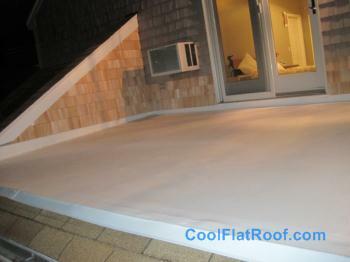 More pictures of this flat roof in Old Lyme, CT. 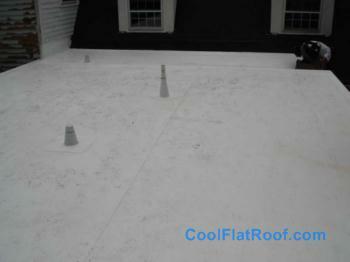 These elderly homeowners were having ponding water issues on their flat roof, and did not want to clean the snow off the roof any longer. 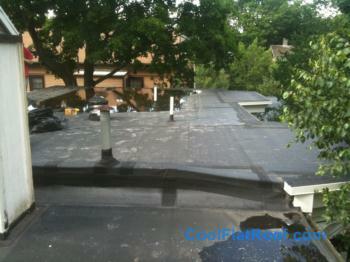 We installed new IB Roof with Tapered insulation, which eliminated any ponding, and diverted all water to the gutters. 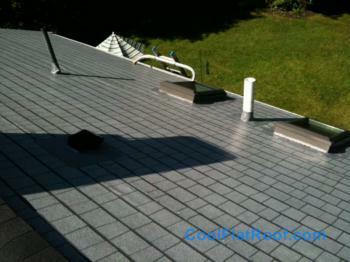 We also installed new gutter guards to make this roof as low maintenance as possible. 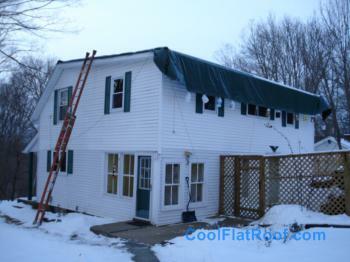 This low slope roof was leaking badly, causing complete gutting of the two bedrooms below it, replacement of all roof decking and also hiring a mold removal contractor to clean the the mold / mildew which formed between roof rafters. 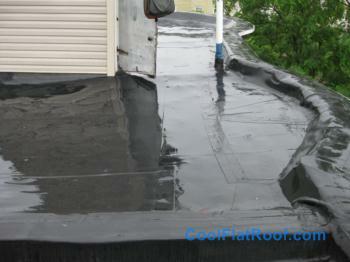 The roof was patched many times but kept on leaking. 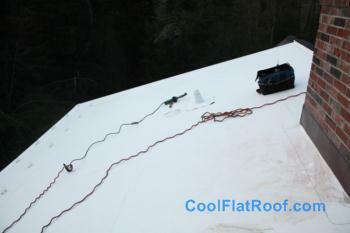 The homeowner and his buddies stripped the old roofing (to reduce installation costs), and covered the roof with a tarp, which began to leak slowly after the first rain. 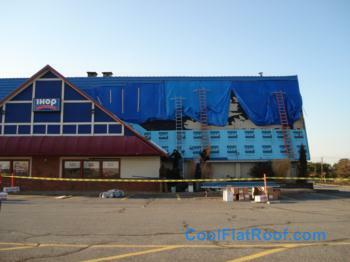 We came out at our earliest availability, as the roof needed emergency replacement. 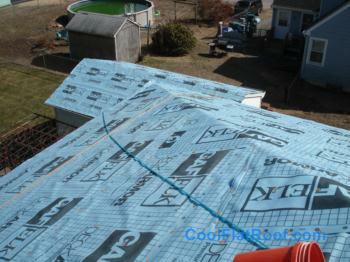 A new IB roof with special flat and low slope roof ridge ventilation system was installed – read a full review of this roofing project in Andover, CT.
Can you tell me if yuu supply roof perimeter flashing prevention devices to address tornado high spped winds ? 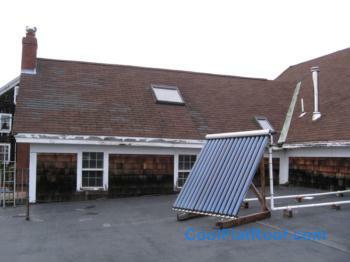 Do you install in Greenwich Ct? 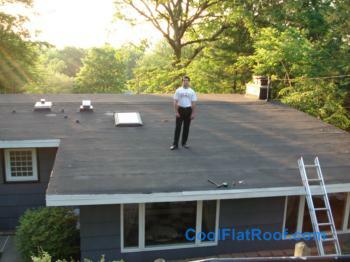 If so, I would like an estimate on a residential flat roof. 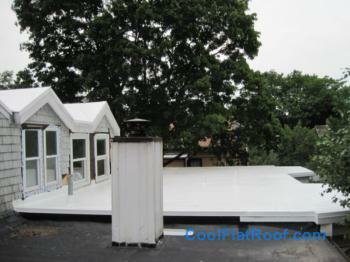 Please fill out our estimate request form here and we will contact you. 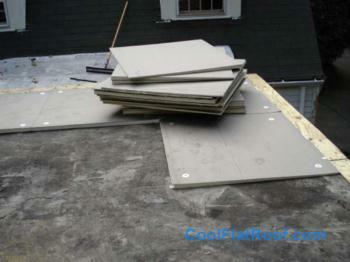 All you have to do is is put “pitch pans” around the railings or 4″ x 4″ wood posts, I see in the pictures. 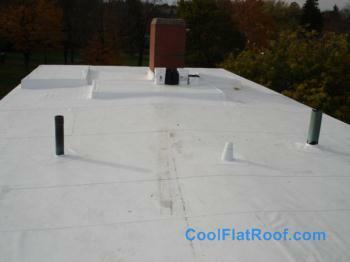 Don’t forget the pourable filler and hardener. 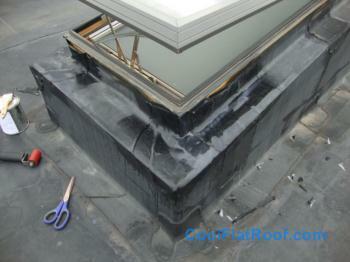 Why put pitch pockets when IB Roofs makes pre-fabricated post flashings that fit tightly around the post? 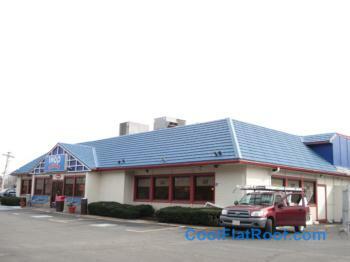 Also Ray, this is a commercial site – please refrain from posting you advertisements here. 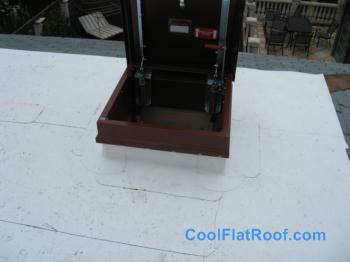 There is a close-up picture of a railing post and roof flashing, toward the middle of the page. 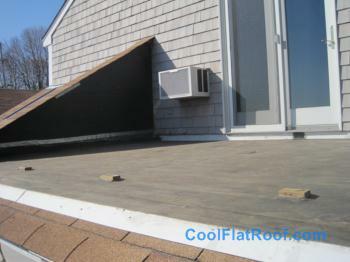 I would like to see details of the roofing penetrations to install deck railings. 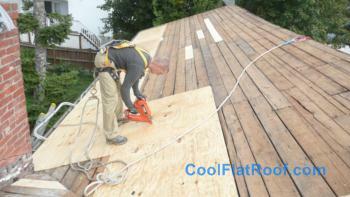 I’m replacing a 12×24 deck attached to the side of my house in California. 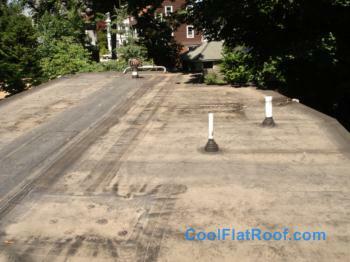 We have a rubber roof – 2 years old. 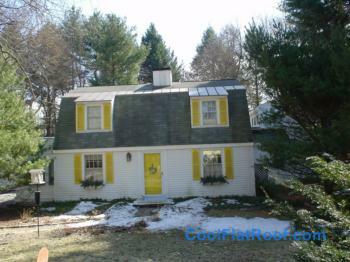 It has railings all the way around. 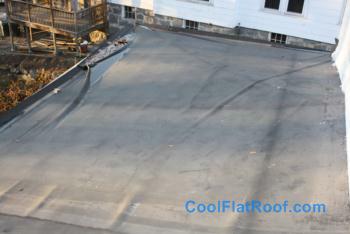 Was looking at ways to put some type of flooring/covering/decking on it that can walk on it and put some chairs on it? 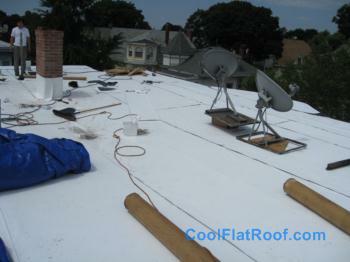 CAn you put your product over a rubber roof?